Presently a paradise for families.....friends ....and ....businesses ! Wake up to the music of birds singing... look out your window and what do you see? Beautiful huge cypress trees bordering the Guadalupe River. If you are lucky you may spot a blue heron, a drinking deer, or at least a lazy turtle on a lost floating branch. This beautiful property is situated on one acre of land and encompasses 165 feet of waterfront. There is a floating dock housing one canoe and three kayaks. This non-smoking house has eight bedrooms (9 queens, 4 singles, 1 double), 6 1/2 bathrooms, fully-equipped kitchen, piano, 2 living areas each with a dining room table and TV, as well as a gorgeous view of the Guadalupe River. Outside there is a gas grill, a bar-b-q grill, a fire ring, several addirondack chairs, 5 tables with chairs that sit 24+, 2 swings and horseshoe game. Perfect for relaxing and entertaining outside. The entire house has a waterfront view. The house is located half a mile upstream from historic Gruene, where you can walk, ride your bike, tube or paddle down to. And it is only three miles from the Schlitterbahn Waterpark, voted America's #1 waterpark for 10 years and counting. Come enjoy the most beautiful house and cool yard in Texas! Please check vrbo listing 29347 for 24 pictures of this property. My name is Maria. I am originally from Lisbon, Portugal. I moved to the United States in 1980. I moved to New Braunfels in 1989 and began a Bed and Breakfast. I have recently converted the B&B into a cozy, quaint vacation rental home. 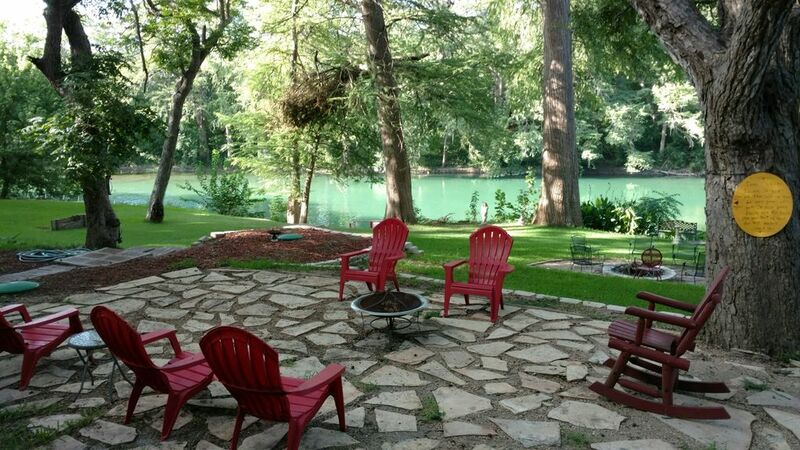 Breath-taking yard with an amazing view and access to the Guadalupe river. You are able to swim, fish or canoe any time. Proximity from downtown New Braunfels is within 5 miles and we are located 1 mile from historic Gruene, TX. Huge pecan trees and cypress trees provide marvelous cool shade in the Summer.Abundance of birds, turtles, fish, deer, ducks, etc..
By taking the kayaks or canoe up river you have access to white water rapids, and by floating downstream you will quickly find yourself amidst historic Gruene, TX, Many adventures to be found. Plenty of wild life watching awaits. Abounding number of deer, turtles, birds, fish and more. 6 1/2 bath total. 2 with shower only, 4 with bath tub and shower. 1 mile from Gruene Hall and Gristmill. Gruene is the historical district of New Braunfels. Lying down on bed on sitting on chair you can view water as the house sits on lower banks of Guadalupe river. Essentials such as salt, pepper, spices, sugar etc. provided. 2 dining areas. 1 seats 8, 1 seats 6. Kitchen table seats 4. Horse shoe game in yard. Perfect location. House is large with a lot of bathrooms, plenty of blankets, pillows and towels. Kitchen had enough dishes and utensils for an army. Needs some updating but you can’t beat the location and the property itself!! We can’t wait to go back. This home turned out to be exactly what we were looking for. It has lot's of room for our people. The owner was very nice and accommodating. I will definitely recommend this to friends and family!! We booked this house for several families to use as a base for Wurstfest. It worked out perfectly. Plenty of bedrooms and bathrooms and everyone had their privacy, yet we had great "common areas". It is close to town, yet far enough away to have a great tranquil setting. Maria was extremely nice and helpful. We plan to come back! Dear Russell :Your review put a HUGE smile in my face. See you next year. Beautiful setting! Close to town. Maria was friendly and helpful! I enjoyed meeting your family and have worked on the shortcomings. Property was beautiful, and the owner was very nice! Your review makes my day. This property was absolutely ideal for our gathering of 20 adults. We are all close friends from college and were meeting in NB from all over the state of Texas. The sleeping arrangements were perfect for 10 couples and I could see that the house would be great for kids as well (though there are stairs to go to lower and upper levels). The property is right on the Guadalupe and was a 3 minute drive to Gruene Hall, restaurants, and Rockin R river trips. It rained for a lot of our trip, but we were able to get out the toobs that were in the outdoor closet and tie up to the private dock. It was absolutely perfect. The kitchen was fully stocked with everything we needed as well as towels and wash clothes in all the multiple bathrooms. The only hiccup was the steep driveway, but there is parking at the top of the hill, so it worked out. All in all it was a perfect getaway for a lot of weary parents ready for a weekend away. Can’t wait to come back next year!